is the source of blessing. as well as earthly blessings (Dt 28:2-6). and commanded peace and obedience to the Church (Jn 16:33). to which they have been called to serve (Dt 12:7). and will pass on curses to his descendants (Ez 14:9-23). to a thousand generations (Ex 20:6). and be a delight to God. in order to keep our spirit holy and pure. for our children, prosperity and peace. with sacred heart and deeds. In the Christian’s faith, it is basic knowledge that God gives us the blessing that extends to a thousand generations. Some people believe that only those who have a great faith can receive this blessing. However, the blessing is promised to all who believe. So, if you are a Christian, you must have the will to inherit your blessing to a thousand generations. This is the attitude that you ought to have as a Christian and is a way of conforming to God’s way of leading us into eternal life. God has given us His word. That is because it is His word that is the only way for us to possess God’s blessing. On the Lord’s day, we attend the worship service and listen to the sermon. The very time of worship is when we hear God’s word and receive it by faith. Unfortunately, there are some people who do not recognize it as God’s word but rather judge the content of the sermon by their own standards. The problem is that even though they are listening to God’s word, if they do not acknowledge it as God’s word, they can never be blessed as God wants to bless them. The church is the framework by which God gathers and raises believers, nurturing them by His word, and the mechanism which God established to bless them. God has never abandoned those who are bought with His blood. God wants believers to remain in the glory that His Son enjoys. To this end, it is through the church that God keeps all believers until Jesus Christ comes again to the world. Overseer preaches God’s words in the church. And then the people believe and follow the Word of God proclaimed by the overseer. When both the overseer and the members faithfully carry out their own duties the church can stand firm. Each of the duties must not be interrupted by any situation. But, those who are weak in faith are susceptible to negative thoughts. Once a negative impression about the church or the overseer is imprinted in their hearts, they unconsciously have negative viewpoints on the church when observing what happens in the church. This is not just an obstacle in their own faith lives, but also negatively affects others around them, so we have to be cautious of it. Among the factors that can negatively affect people’s thoughts is the influence of the recently developed online Social Networking Services (SNS) which have a significant effect on people. Through the services, many people can share information freely, but, at the same time, increasing numbers of people are hurt due to false information and maligning words. What is worse, this can even be used as a tool for blaming and attacking the church. If you want to keep your soul clean, you must not listen to that false information. Once the seed of a negative thought is sown in your field, which is your heart, it can never be removed, but rather becomes the source of anguish, even producing further negative thoughts. There are two components to preaching God’s word. First, there is the grace that comes by the precious blood of Jesus Christ. Church members repent after listening to the sermon. Once they come to be under the grace of the precious blood, their hearts are cleansed. The second component is the instruction on the conduct of the believer. The people receive instruction regarding their conduct through which they must sanctify their souls by their actions and decisions. Therefore, anyone who hears the sermon should repent in the light of the message, and make up their mind to act in accordance with God’s instruction. It is idolatry that prevents this from happening. Most people think of idols only as images or figures made of stone or wood but those are not the only idols. If the love and devotions of the saints which belong to God are redirected to something or someone else, then that thing or person has taken God’s place and has become an idol. Idolatry is a betrayal against God, which seriously pollutes the soul of the saints. We must not get involved with matters that might corrupt our souls. We are responsible for blessing our children as believers. Leaders of Israel, even in their old age, blessed their children with the authority that had been given from God. That is because God’s blessing can be passed on to their children not through the flesh but through the soul. So, in order not to block the inheritance of God’s power to our children, we must keep our soul clean and be approved by God through our good works. We should be particularly cautious to not allow ourselves to be exposed to the blame and criticism against the church. Once you have been exposed to them, even without your wanting them to, they will cast a shadow upon your heart opening the door for demons to invade. On the other hand, if we choose the words and thoughts of faith and hope, the works that are pleasing to God can be accomplished through us more readily. To build and grow a church, many members must endure hardships in order to keep their souls clean. In addition, many should sacrifice and devote themselves to keeping the souls of others clean. This is not at all easy. But many have done so, and also are doing it to serve the church. There must not be any casting of blame or malign that might discourage or hurt those who have been dedicated only to God. Even unbelievers treat the church with a certain level of respect. Even those who oppress others show some respect when they meet pastors. Even thieves are reluctant to steal the church’s offerings. Unfortunately, the blaming and slander is happening among believers in the church and fostering distrust of the overseer. These kinds of acts not only destroy their souls but also leaves indelible scars on other people’s souls. We must not defile our souls until the Lord leads us into His kingdom. God’s will is being fulfilled through those who keep their souls holy. Thus, God remembers not only them but also their descendants. That means those who are holy inherit blessings and prepare heaven for themselves. The overseer of the church is the speaker that delivers God’s words. Although the overseer is just a man, God ordained him to bless the church members. When God appointed Aaron as the priest of Israel, He made him wear a special garment that was made for the priest. This helped the people of Israel acknowledge the authority of the priestly office by displaying the glory and beauty of the priesthood. (Exodus 28:2) Likewise, God covers an ordinary person with the mantle of ‘Overseer’, and proceeds to do His work. Therefore the saints should humbly follow the guidance of the overseer just as sheep do not follow another’s voice but the voice of their shepherd, so the saints should pay attention to the voice of the overseer. God is the source of all blessing. He blesses us. Deuteronomy 28:2-6 says, “If you obey the LORD your God: You will be blessed in the city and blessed in the country. The fruit of your womb will be blessed, and the crops of your land and the young of your livestock—the calves of your herds and the lambs of your flocks. Your basket and your kneading trough will be blessed. You will be blessed when you come in and blessed when you go out.” Because blessing accompanies God, those who are with God will be blessed in all the circumstances of their lives. The blessings introduced in the time of the Old covenant were imperfect. But thanks to Jesus Christ, we can completely enjoy God’s blessings. He has thoroughly dealt with the curse of sin and death and the destruction that would otherwise hinder our blessings. And He commanded us to obey. Since He has made all our ways straight, we can now see what is before us and walk the road that is before us. We must build up our households to receive and enjoy God’s blessings to a thousand generations. In order to do this, we must do two things: First, we must preserve our souls. Second, we must serve our church with devotion through holy conduct and good deeds. Those who do these two things can bless their children and families. If you believe God created all things, that He is the atonement for our sins, and that he will resurrect us, then you must also believe that He will bless us while we are here on earth. We are the church blessed to a thousand generations: Not just the church that ‘will be blessed’, but also the one that ’already has been blessed’. God has promised to bless us not to two or three generations but to a thousand generations. His blessings are as firm and trustworthy as His word, for He has spoken it. For the promise to be fulfilled in us, let us keep our souls that were bought by the blood of Jesus Christ. Let us be under the power of His precious blood. Then let us conduct ourselves in a right and godly way as members of the Lord. Let us exercise our faith, our spiritual inheritance, for the success and happiness of the church. Looking back on all the days of my life, I cannot find even a single thing I did well. The only thing that I believe I did well is be patient. For the last eighty years I have gone through the world, being patient again and again. Looking back on those days at the age of eighty, I remember a lot of events that make me think, ‘Being patient at those moments, I did very well.” If I had not been patient, I wouldn’t be who I am today. And I do not have long left to live, so I am not sure how much more I will have to be patient. Someone once said to me, “I can see the radiance in your face.” So I asked that person what radiance it was, and he said, “the radiance of patience.” Patience is one of the fruits of the Holy Spirit. Perhaps I exhibit patience because the Holy Spirit has given me the power to be patient again and again. I remember patience as one of the greatest qualities of my fifty five year-ministry. The work in the church is so delicate. It is like a feather that it is easily swayed by a gentle wind or soaked by light drizzle. But enduring it is only possible by patience. Resentments, dissatisfaction and complaints always come back to the pastor. But so what? I have to be patient again and again. If there is misunderstanding or conflict, the only answer is patience. Young people do not realize how patient their mothers have been with them, because their mothers tolerate their annoyance. But when someone else offers a favor, they are very appreciative of it. In the same manner I have endured numerous annoying situations that many church members are not even aware of. I have taken myself up to the pulpit as if I have not been annoyed, not to put on an actor to play a role, but in order for my church to survive. I could do otherwise. I strongly desire that my saints be patient with me, for the sake of our church. Although the Devil provokes us to resentment and backbiting, we must let the Holy Spirit govern all of our actions. From now on, let us not hate one another, but let us pray for each other and for our weakness. Let us never alienate, upset or be the cause of division among each other, ever. but gave us birth to become His children (Ps 2:7). and thus love us forever (Rm 5:8). and helps us to discharge our duty. like the Prodigal Son (Gal 5:17-21). and live away from God. hinder the work of God. wanting us to repent and return to Him (Lk 15:32). The Lord’s church is one family who serve the one Father (Gal 4:6). with the guidance of the Lord Jesus. or praying for the church. We are the children of God. This is much more than being saved from sins. However, many Christians live their lives as if they do not realize that they are the children of God. We must purposefully bear witness of our identity as the children of God so as not to forget our position as His children. The Bible testifies about the children of God in many ways. John 1:12 says, “Those who receive Him, those who believe in His name, He gave the right to become the children of God,” and Hebrews 2:11 says, “Both the one who makes men holy and those who are made holy are of the same family.”Here, ‘the one who makes men holy’ refers to Jesus, and ‘those who are made holy’ indicates us, God’s children. Both Jesus and we ourselves are the ones who are from God. That is why Jesus is not ashamed to call us brothers. Of course, since Jesus was with His Father from the beginning He is not the one who was born of God. But, despite the different starting points, we and Jesus are the same children of God. However, for those of us who have obtained the status of a child of God, we have a special obligation to fulfill while we are here and that is doing God’s work as the servants of God. On earth, even though you are a child of God, you cannot fully enjoy the glory given to the children of God. But you do not have to be disappointed. Just as a prince does not become a beggar if he wears rags, so you do not lose your identity as God’s children even if you work as a servant of God. Rather, by being His servants, we can humble ourselves. ‘Born of the Spirit’ means ‘birth by the Spirit’. Those who are born again are those whom God gave birth to by the Spirit. Many parts in the Bible testify that God gave birth to us. John 3:5 says, ‘No one can enter the kingdom of God unless he is born again.’ And 1Peter 1:3 says, ‘His great mercy He has given us new birth into a living hope through the resurrection of Jesus Christ from the dead.’ Also 1Peter 1:23 says, ‘For you have been born again, not of perishable seed, but of imperishable, through the living and enduring word of God’, and Romans 8:15 says ‘The Spirit himself testifies with our spirit that we are God’s children.’ In this sense, our spiritual status in Christ Jesus is not the result of God’s creation, but of God giving birth to us. We are those who were born of the Spirit. But this does not mean that we have become perfect. As long as we are in flesh we cannot escape from the fact that we are creatures which came from the dust of the ground. In other words, we can be corrupted at any time since we are in flesh. In many cases, believers become corrupted even after they became the children of God. Of course, that does not mean that they turn back into ‘sons of hell’. They are considered a prodigal son, in this case. Even if a child behaved wickedly or abandoned them, parents miss their child and they wait with longing for him to come back to them. The heart of God the Father so longs for us to return to Him. Many people compare God their heavenly Father to their earthly fathers. However, the fatherhood of the world cannot be compared with that of God. The fatherhood that God has revealed to us, can be understood as ‘parenthood’ which encompasses both fatherhood and motherhood. Generally a father has love for his children, but it cannot compare to the love of a mother. Our heavenly Father’s love is like the perfect love of a mother and a father. Even if children do not ever come back, it is a father’s heart that waits for his children. Even if children abandon their fathers seeking after pleasure, fathers do not hate them, but miss them and worry about them. Likewise, God reveals His fatherhood only to His children. He does not worry about His servants being corrupted as He does regarding His children. For example, how would the master feel if his paid workers betrayed him? If they were to steal their wages and flee away, the master would say, “If I catch them, I will punish them!”, and if they were just to flee away stealing nothing, he would say, “Those betrayers do not matter anymore!” Paid workers would know the heart of their master. Generally, paid workers who have betrayed their master do not come back to him. Therefore, for God’s servants, corruption is the same as eternal death. The Bible tells a story of younger son who left his father after receiving his share of the estate. Not long after he left his home, he squandered all his wealth, so that he was not even able to make ends meet. After this he thought about the servants who work in his father’s house, saying in his heart, ‘I would be better off returning to my father to live as one of his servants. I do not deserve to be accepted, but I will beg him to accept me as a servant.’ As the son is about to arrive at his father’s house, his father, having waited for him to come, rushes to his son and hugs him weeping. Then he ordered his servants to clothe his son with the best garment, a ring, shoes, and to hold a feast for him with a fatted calf. When his older son heard this he became angry. He says to his father, “Father, Look! All these years I’ve been slaving for you and never disobeyed your orders. Yet you never gave me even a young goat so I could celebrate with my friends. But when this son of yours who has squandered your property with prostitutes comes home, you kill the fattened calf for him!” And his father replied, “My son, you are always with me, and everything I have is yours. But we had to celebrate and be glad, because this brother of yours was dead and is alive again.”Through this story Jesus revealed God the Father’s heart toward His children. While we remain in the world, the Church is our Father’s house. Anyone who has become a child of God must serve the Church responsibly. Of course, servants of God also serve God. However, when a son works for his father and a paid worker works for his master, their level of responsibility cannot be the same. God made us His children who had been His enemies. For this, the One and Only Son had to shed His blood. How much then do you suppose God expects from us? The prodigal son is not some special case, but it is us, ourselves. In the church, there are some prodigal sons who cause trouble for the church. Even though the degree may vary, many people keep some distance from God even though they attend the church. Even though we are the children of God, at the same time, we should remember that we are the ones who are responsible for carrying out God’s work. God gives us duties through the church. We must accept these duties and serve the church as servants of God. Some people might see the duties in the church as trivial. However, because we are God’s children, we should accept these duties with gladness. Some people are considering turning their back on the church, not considering the church their family, even though they have become God’s children. Others even use the church for their own financial benefit. When the Pharisees criticized Jesus’ disciples for not washing their hands before they ate bread, the Lord said of them, ‘These people honor me with their lips, but their hearts are far from me.’ (Mark 7:1~23) In like manner, no matter how you confess your love for God with your mouth, if you hate your church, then you hate God. There are some people who criticize the church just because the church does not suit them. This is comparable to one criticizing God just because God does not suit him or her. ‘Love your brothers’ is the same as saying ‘Children, love each other’. God’s children must love each other. God’s children love their brethren and so testify that that they are born of God. (1John 5:1~4) While we love our brethren because we love God, we must also love our brethren to keep the Lord’s commandment to ‘Love each other’. God’s children must practice love. God has done His part until He calls us as His servants. He took our sins, became cursed instead of us, gave us His promises, and made us His sons and daughters. Now, it is time for us to do our duty. Just as a son takes care of his father’s house first when the house is in trouble, so too must we help our church when our church is in need. Our lifespan on earth is the opportunity for God’s children to do work for the Father’s house. Even if we may seem to the world to be clothed with the lowly garments of a servant, if we love church and are faithful to our duty, we will be embraced by God into the bosom of Him who is waiting for His children’s glorious return. After birth, each person begins to dream. Fathers become role model for boys, and mothers for girls. As they grow up, kind individuals become their role models, so that some children dream of becoming fire fighters, others nurses, still others teachers, and scientists. However, as they get to know the world deeper, their dreams shift to the thought of making money. They consider themselves so small before the world and for that reason, they are likely to spend more money, or they consider themselves so small before the world. They start with those ‘good’ dreams, but as their dreams fade away, they become disappointed, and eventually frustrated. So, they are likely to be cynical about the reason they exist in the world, and also come to see all others as their enemies. And so, as they grow older, they do not consider the next phase of their lives, rather they only suffer and grieve over their twisted tendency to mistreat themselves. The sound, of the bell through which the Lord Jesus called me while I was struggling in the tough world, still rings in my ears. I was preoccupied with the thought that I must not be lazy, which I considered to be one of my life’s creed. So I feel I do not have any of the childhood memories that most children and teenagers have. Although I made endless efforts throughout my life, ultimately I have many regrets. Since I have battled through so many struggles due to my sinful desires, I regret the days gone by. I am a servant of God, but I am a man too. To live as both a servant of God and as a man, I want to have both Christian faith and literature. Yet, as I always have to stand before the members of the church and read their countenance, how could I describe that discomfort I feel? The longing for the kingdom of God that I yearn for day by day coexists with a love and yearning hidden in my heart. While there is love for the opposite gender, there is love that goes beyond that. . I have experienced so much disappointment with the latter that it is as though I have my enemies ight before my eyes. Perhaps it was for this that the Lord Jesus commanded, “Love your enemies”. As I see all kinds of chaos and confusion in the world, I sense that the day is drawing near for me to wrap up all things. Even by just writing about these vile things, I desire to comfort my sick heart. My literature contains what I saw throughout my experiences in the world. that obeys His commandment (Ac 20:28). and nurtures us through the overseer and His servants (Ac 9:31). is about giving us His true love. and finally bear everlasting fruits (Jn 15:5). grounded on sincere love towards fellow saints (1 Jn 3:23). the spiritual food for our eternal life. and be united in one spirit of love and perseverance (He 10:22-23). for our church to gain strength. and encourage and compliment our fellow saints (He 10:24-25). They will help you with all their heart. God cannot be compelled to love someone. In other words, we cannot say He must love someone. We on the other hand absolutely must love. Even if it is difficult or unattractive, we must do it. Jesus said, “the Father loves me because I always obey His commands”. God the Father loves Jesus, not because He is the Son of God but because He always obeys the Father’s command. In the same way the Lord loves us when we obey His commands. The command that Jesus had received from the Father was ‘Be a sacrifice and pass on my love to mankind’. It was not an easy or attractive proposition even to the Son of God to let Himself be killed. Nevertheless, Jesus obeyed the Father’s commandment. As a result He received the love of the Father and obtained the reward: the salvation of mankind, the judgment of the Devil and the inheritance of the heavenly throne. The commandment we received from the Lord was to ‘love one another’. The object of love mentioned here is not the neighbor in a general sense, that is, local residents, but the members who comprise the body of Christ. The reason we must love the people who form one body in Christ is not because they are lovable, but because the Lord commanded us to. Jesus gave His life to obey the Father’s commandment. What then must we do who are a mere creation? Why is the commandment important? It is because the remuneration to those who keep the commandment and those who do not is completely different. When Israelites were trained under the law, those who did not keep the commandments of God were immediately punished. In the New Testament dispensation, those who disobey the commandment of God do not immediately receive the penalty or suffer the curse of their disobedience. This is because in New Testament times a person’s soul must pay the penalty for sin when they violate the commandment whereas in the Old Testament times they suffered the penalty in the flesh. At first glance it may seem that those who violate God’s commandment and live to satisfy their flesh prosper. However, they who violate God’s commandments will find themselves being dragged away from God and growing hostile towards God. It is an unchangeable principle that God punishes disobedience. (Deuteronomy 7:9~11) In the New Testament Times, the punishment is merely postponed a little while. Nevertheless, you must not be lulled into believing that the penalty for sin has ceased because there has not been an immediate recompense for disobedience. God will remember all that we have done and how we have violated His commandments and He will settle all accounts with us on the last day. The commandments of God can be categorized into the ‘general commandments’ and the ‘new commandment’. Jesus said, “Teach them to obey everything I have commanded you”, the general commandments are to be formally preached by the Lord’s servants. 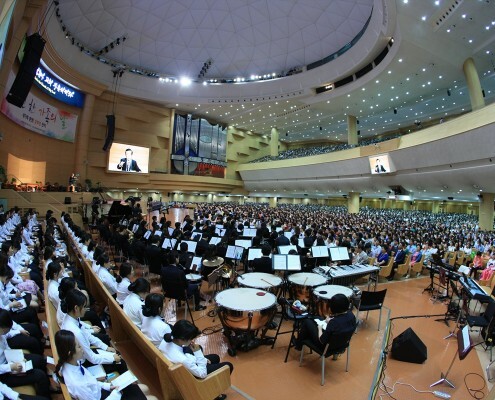 The pastor explains the scope of God’s word to the congregation and instructs them on how to keep God’s word. He explains the word in detail as if he is breaking bread and distributing it among them. As for the general commandments, Jesus said, “Whoever has my commands and obeys them, he is the one who loves me. He who loves me will be loved by my Father, and I too will love him and show myself to him”. (John 14:21) Among the words spoken by Jesus, “Love one another” has been specifically singled out as a new commandment (John 13:34~35). John the Apostle had also emphasized the new commandment several times in his letters (1 John 2:7, 4:21, 2 John 1:5). This new commandment should be our central focus that we must obey because the Lord gave it a special emphasis. This new commandment is preeminent among the words that Jesus spoke and the determinant of the blessing or curse we receive in the present. Jesus gave us the new commandment in order to unite the church. It is quite natural that God the Father wants His children to be united. Jesus Himself prayed to the Father, “Make them one as we are one!”. Essentially, it is so difficult for men to love each other and become one, and they fight it. This is because we were once the children of the Devil. However, we must now put away the former way of thinking when we belonged to the Devil and carry out what Jesus wants us to do instead. Jesus said, “If you obey my commands, you will remain in my love, just as I have obeyed my Father’s commands and remain in his love” (John 15:10). The commandment that the Lord received from the Father is to love mankind, and the one we received from the Lord is to love the church. If we obey the Lord’s commandment, He will love us, and we will be full of joy, because we are loved by Jesus (John 15:11). What lack or worry is there for those whom Jesus loves? We must train ourselves to love and serve the church. It is difficult for the Lord to use untrained people even though they be sanctified. You must not harbor anger against the church or the overseer. For man’s anger does not bring about the righteous life that God desires (James 1:20). Isaiah 66:4 says, “so I also will choose harsh treatment for them and will bring their fears upon them, because when I called, no one answered, when I spoke, they did not listen; but they did what was evil in my eyes and chose that in which I did not delight”. Applying this to the New Testament Church, ‘I’ in this passage correlates to the church. The church is the body of Christ. If a person abandons the church, Jesus will also abandon him, and if he loves the church, Jesus will also love him make him fruitful. If you want to receive God’s help in times of trials, then you must love the church in the mundane and ordinary times. If you want God to aid your children, you must support the church in the humdrum of ordinary times. The blessing for the man who loves the church will continue even to a thousand generations. We must love the church in the midst of trials, adversity, and in sorrow. If you entertain thoughts of leaving the church someday, you leave yourself open to potential future temptation. We are God’s representatives. Let us foster a kind and friendly church environment by obeying Jesus’ commandment to love one another. He is the God of all comfort. He comforts us in all our troubles, so that we may in turn comfort those in any trouble with the comfort with which we ourselves have been comforted by God (2Corintians 1:3~4). We are the instruments of comfort and encouragement. If you see a brother who has fallen into temptation around you, comfort him and allow God to knock on the door of his heart. Let us comfort and encourage our children, our wives and our husbands. The church is a place for devotion that God has ordained, and the overseer is a servant whom God has appointed to bless the congregation. Let us thank the Lord Jesus for giving us the church and let us bear one another’s burdens when the church is experiencing adversity. Support the overseer so that he may effectively carry out his God given function of conveying the blessings of God to the church. When the church becomes united as one, then God will accomplish His work through the church. I was born as a human and am living as a human. Humans have birth and death, and development and activities, having descendants and playing a role in the society. The role varies from great and to small, and humans can produce results according to how much they use their abilities. Even though human beings are made of the dust of the earth, they do not just live by what comes from the dust but also have wisdom and knowledge, and the capability to govern the creatures – a spiritual being distinguished from other animals. I can speak and write. I can remember the past and envision the future. Thus, I am an average man who has feelings. But sometimes, I have sinful desires which are hostile to the spirit, anguish because of my body, and the spiritual anguish to live spiritually as well. Thus, I make mistakes and take pleasure in worldly matters. However, this is where it really matters. How many days do I have to live? I have to keep my soul until I am transformed into a spiritual body after I take off my flesh, and the only way to keep my soul is to live for my soul. But I am a man. Since I have flesh, I have to accept this. Some would want me to be like a god, but that is actually an impossible requirement. The important matter is how to live beautifully and humanly as a human. It is hypocrisy to disguise a man like a god when he is unable to be a god. But God wants one thing from me, a mere man, and if I am to follow God’s desire, my flesh suffers, but if I follow my sinful desire, I come to go against God. Every morning when I open my eyes, both my flesh and God’s will pressure my soul in turn. That is why I want to live by the gospel. The gospel admits my weakness in my flesh and covers me with mercy and compassion. It is the gospel that delivers grace which the Law does not have. The gospel accepts me, a man, and greatly comforts and encourages me. If I were under the Law, I would not be treated as a man. As I have been given freedom and faith by grace which I am powerless to do due to the weakness of my flesh, I am the one who truly has freedom. I have freedom in my soul and have been given great freedom in my life. I want to be regarded as a natural man who has wants, who knows how to possess, and love. I am a pastor. However, before that, I am a man. Thus, although being treated as a pastor is important, I want to be treated as a man. Lord! I am a child of God and a servant of God. However, I am just a man who lives in the world. Thus, I am always clothed with Your grace.